Lithomancy is the practice of performing divination by reading stones. In some cultures, the casting of stones was believed to be fairly common–a bit like checking one's daily horoscope in the morning paper. However, because our ancient ancestors didn’t leave us a lot of information about how to read the stones, many of the specific aspects of the practice have been lost forever. One thing that is certainly clear, though, is that the use of stones for divination has been around for a long while. Archaeologists have found colored stones, likely used for foretelling political outcomes, in the ruins of a fallen Bronze-age city at Gegharot, in what is now central Armenia. Researchers suggest that these, along with bones and other ritual items, indicate "divinatory practices were critical to the emergent principles of regional sovereignty." It is generally believed by scholars that early forms of lithomancy included stones which were polished and inscribed with symbols–perhaps these were the precursors to the rune stones we see in some of the Scandinavian religions. In modern forms of lithomancy, stones are typically assigned symbols connected to the planets, as well as to aspects of personal events, such as luck, love, happiness, etc. "For maximum effectiveness, the stones used in a reading should be gathered from nature during favorable astrological configurations and by using one's intuitive powers as a guide." By creating a set of stones with symbols that are significant to you, you can make your own divinatory tool to use for guidance and inspiration. The instructions below are for a simple set using a group of thirteen stones. You can change any of them you like to make the set more readable for you, or you can add to or subtract any of the symbols you wish–it's your set, so make it as personal as you like. 1. The Sun, to represent power, energy, and life. 2. The Moon, symbolizing inspiration, psychic ability, and intuition. 3. Saturn, associated with longevity, protection, and purification. 4. Venus, which is connected to love, fidelity, and happiness. 5. Mercury, which is often associated to intelligence, self-improvement, and the overcoming of bad habits. 6. Mars, to represent courage, defensive magic, battle, and conflict. 7. Jupiter, symbolizing money, justice, and prosperity. 8. Earth, representative of security of home, family, and friends. 9. Air, to show your wishes, hopes, dreams, and inspiration. 10. Fire, which is associated with passion, willpower, and outside influences. 11. Water, a symbol of compassion, reconciliation, healing, and cleansing. 12. Spirit, tied to the needs of the self, as well as communication with the Divine. 13. The Universe, which shows us our place in the grand scheme of things, on a cosmic level. Mark each stone with a symbol that indicates to you what the stone will represent. You can use astrological symbols for the planetary stones, and other symbols to signify the four elements. You may want to consecrate your stones, once you've created them, as you would any other important magical tool. Place the stones within the cloth and tie it shut, forming a bag. To interpret messages from the stones, the simplest way is to draw three stones at random. Place them in front of you, and see what messages they send. Some people prefer to use a pre-marked board, such as a spirit board or even a Ouija board. The stones are then cast onto the board, and their meanings are determined not only by where they land, but their proximity to other stones. For beginners, it may be easier to simply draw your stones from a bag. Like reading Tarot cards, and other forms of divination, much of lithomancy is intuitive, rather than specific. 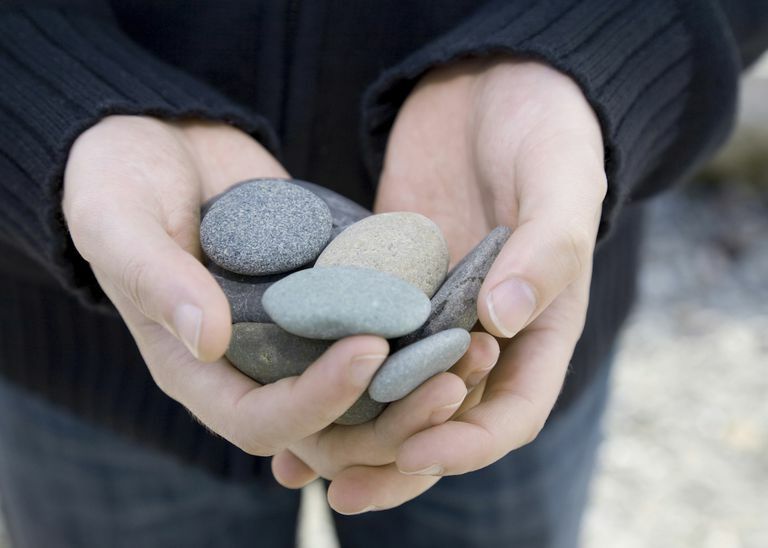 Use the stones as a meditation tool, and focus on them as a guide. As you become more familiar with your stones, and their meanings, you'll find yourself better able to interpret their messages. For a more complex method of creating stones, and a detailed explanation of interpretation methods, check out author Gary Wimmer's Lithomancy Website. How Safe is a Ouija Board? Where Did Tarot Cards Come From?